A truly amazing cello for this price. 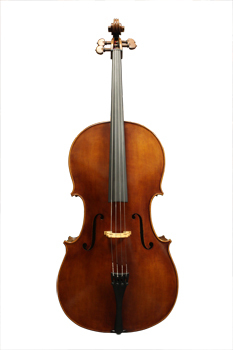 This slightly antiqued cello is made with highly figured spruce and maple. The tone is rich, full, and powerful making it an excellent choice for an advanced player. Adjustment includes ebony fingerboard, boxwood decorative pegs, high quality endpin, composite tailpiece with built-in fine tuners, and D'Addario Helicore strings.